The information below relates to the Derby Award Ceremonies being held on the 22/23 November 2018. You'll find information about the location of Derby Arena and parking availability here. Please ensure you plan and leave sufficient time for your journey. We are running free of charge shuttle buses to and from the Pride Park side of Derby railway station. Please read the itinerary for your ceremony carefully. Make sure you know where you need to be and at what time, such as when you need to register, where to collect your gown, have your photograph taken and when you need to be seated. At any point during the day, if you have any queries, University staff wearing maroon gowns will be able to assist you. 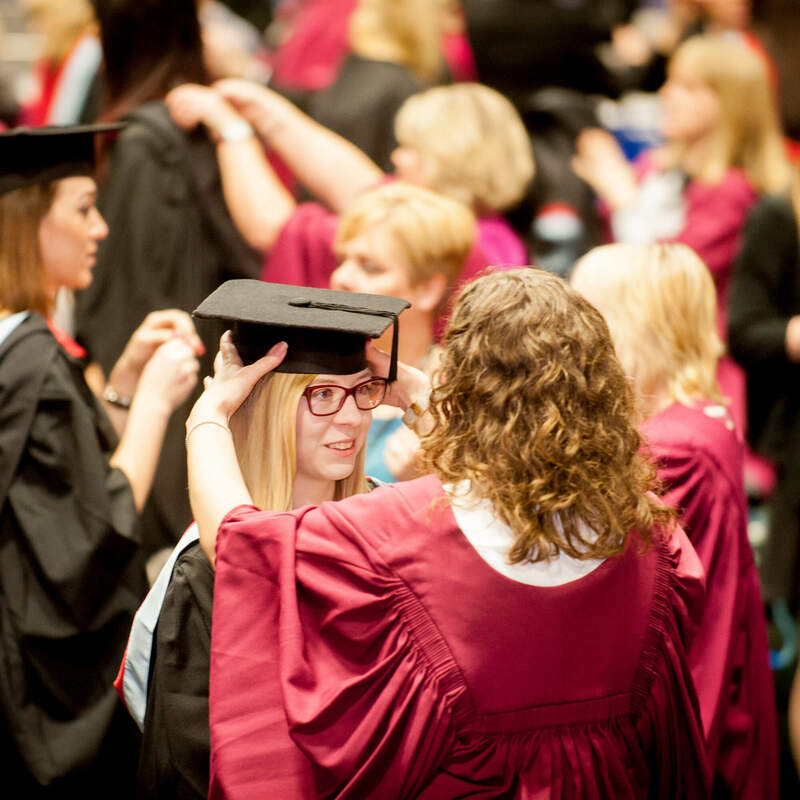 Once the graduand has registered at the arena, you can collect your gown and have your photographs taken at the arena. However, please note that there will be limited time to have your photograph taken before the ceremonies and we do expect queues, so there will be an opportunity to have your photographs taken at the Pedigree Suite and Toyota Suite at Pride Park Stadium after your ceremony whether it's a morning or afternoon ceremony. You'll need a ticket to get into the arena, or if you still need to collect your tickets you will be directed to the queries desk at Derby Arena. Please report to the appropriate registration desk to collect your allocated seat card. It's important that you take up your allocated place as it reflects the order that your name will be read out as you cross the stage. Please make sure that you and your guests are seated in the arena at least 15 minutes before the ceremony is due to start. If you haven't registered 30 minutes before the start of the ceremony, unfortunately we can't guarantee that your name will be read out. Please switch off all mobile phones before the start of the ceremony. If you're late, please go to the registration desk at the arena straight away. The ceremony begins and ends with processions of Executive, Council, civic dignitaries and academic staff. 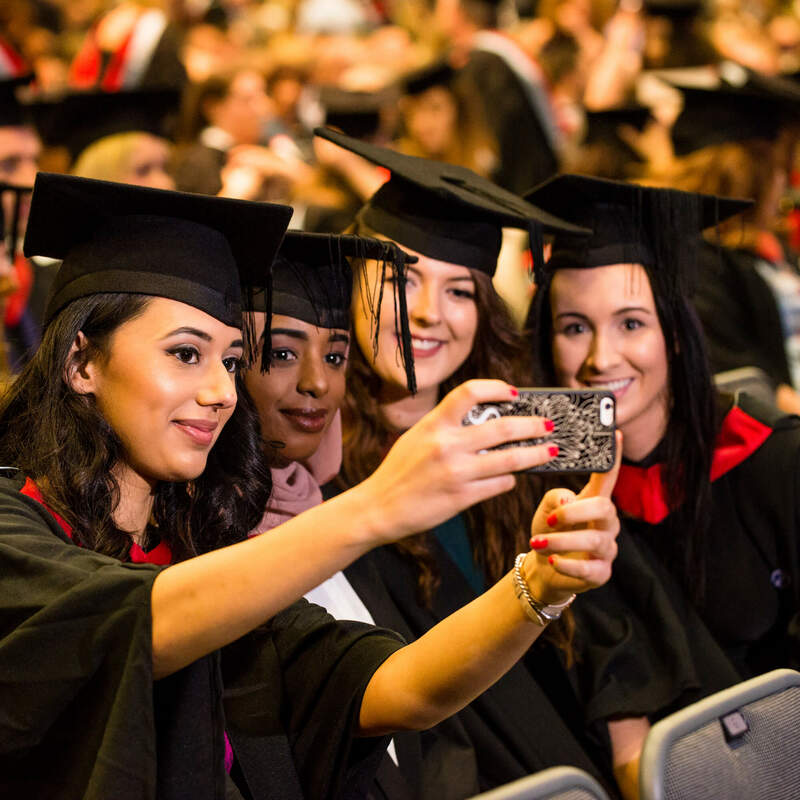 As well as the presentation of the graduates, it includes addresses from the Chancellor or Chair of Council and Vice-Chancellor, and usually the presentation of an honorary degree. Ushers (in maroon gowns) in the arena will indicate when it's your turn to be presented and will direct you through each step. You should then continue walking across the stage, down the steps where you'll be handed your certificate, or letter of congratulations if you've already received your certificate, and return to your seat. So everyone can enjoy the event, please remain seated for the whole ceremony once it has started. At the end of the ceremony, please stand while the stage party and University special guests leave the arena. Arrange a meeting point with your guests, because the foyer area becomes crowded after the ceremony. Please return your gown to the arena by 5.30pm. There will be refreshments available to purchase in the arena. Tickets for an overseas mailing/home address will be available for collection on the day of your award ceremony at Derby Arena at the ticket collection desk. Again, if you have any general queries please contact a member of staff. You'll be able to spot them easily because they'll be wearing a maroon gown.